As the 2017 NFL Seasons officially kicks things off with week one, we’re continuing to move forward by looking back at Super Bowls of the past. Up next; Super Bowl X. 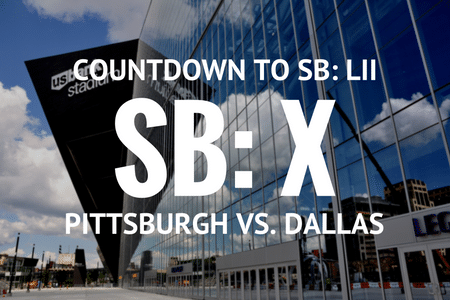 Touting the title of “America’s Team,” the Dallas Cowboys would play Super Bowl X against the Pittsburgh Steelers in front of nearly 81,000 fans. The Steelers would come away victorious, capturing their second-straight Super Bowl victory, 21-17 over Dallas. With this matchup featuring two of the country’s favorite NFL teams, the matchup was highly anticipated in the weeks leading up to the big game. Lynn Swann, wide receiver for the Pittsburgh Steelers, managed to reel in four catches for a Super Bowl record 161 yards and one touchdown, receiving the first ever Super Bowl MVP awarded to a wide receiver. The National Anthem before Super Bowl X was sung by Tom Sullivan in unison with “Up With People.” At halftime, fans were treated to an equally entertaining show by “Up With People,” who attributed the show to America’s Bicentennial. Pat Summerall and Tom Brookshier were the announcers for Super Bowl X on CBS, and brands could expect to pay around $110,000 for a 30-second commercial in 1976.